Astronomers record a massive outburst from a new star in a nearby galaxy. Andrew Masterson reports. Seen in red here, the jet emitted by a fledgling star in the Large Magellanic Cloud. Astronomers have recorded a massive jet of gas emitted by a newly-formed star – a beam that extends an incredible 33 light-years from its source. The discovery – made by researchers using the Multi Unit Spectroscopic Explorer instrument (MUSE) incorporated into the European Southern Observatory’s Very Large Telescope, Chile – is reported in the journal Nature. Although the nature of the beam itself was not a surprise, the observation is significant because it is the first time the phenomenon has been recorded using only visible light. Usually, such beams are obscured by clouds of dust and gas. The jet, dubbed Herbig–Haro 1177, emanates from a fledging star located in a galaxy known as the Large Magellanic Cloud (LMC) – the Milky Way’s near neighbour, located just 160,000 light-years away and often visible to the naked eye in the southern hemisphere. The star itself is about 12 times the mass of the sun. 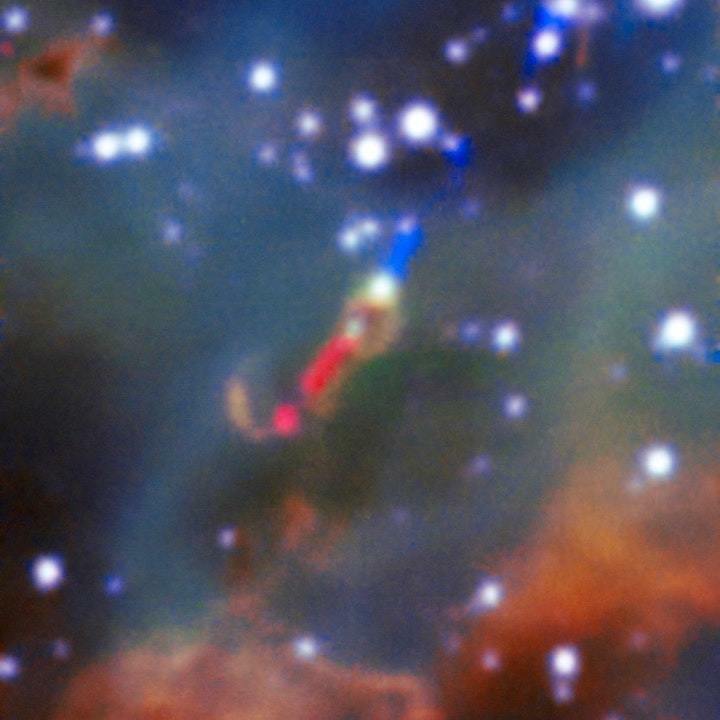 Using the MUSE instrument, researchers led by Anna McLeod from the University of Canterbury in New Zealand zoomed in on a small section of the LMC known as LHA 120-N 180B. This is a type of nebula called an H-II zone, effectively a nursery for new stars. Such regions comprise interstellar clouds of hydrogen. As massive stars form within them, the gas atoms become ionised, appearing to observers as massive bubbles. LHA 120-N 180B comprises a central enormous bubble, ringed by four smaller ones. As well as being the first to be observed in visible light, the jet streaming out from the young star is one of the longest ever recorded. Its structure adds to a growing body of knowledge about the behaviour of newly formed stars. McLeod and colleagues note that the beam is highly “collimated”, meaning that it retains its shape as it travels, rather than dispersing or spreading out. Similarly robust jets have previously been observed (via non-visible spectra) spearing out from both small and massive stars – indicating that at least this aspect of formation is not affected by size. In their paper, the researchers suggest that their observations imply the target fledgling star “probably formed through a scaled-up version of the formation mechanism of low-mass stars”.